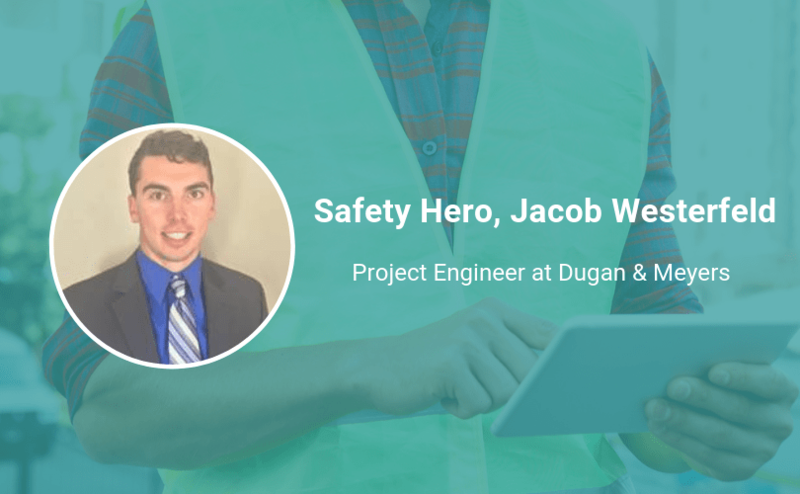 Jacob Westerfeld, Project Engineer at Dugan & Meyers, knows that ongoing safety education and training is vital for any safety leader. His other advice for anyone starting out in safety or health? “Become confident in what you know, and ask questions if you don’t know the correct answer,” he says. That mentality and approach towards supporting safety is part of why he’s our latest Safety Hero. Keep reading to see his other pieces of advice for better safety habits and to see the practical, proven way he builds trust with colleagues at work. Be persistent in getting as much safety training as possible as soon as possible. The more you know, the more you can be relied on to make decisions and gain experience. There will be points that they will be the only person on the job site and there will be times where there is not time to make a call for assistance on what to do. Safety needs to be managed by the carpenters, laborers, and operators. Management cannot be everywhere all the time and may only see snapshots of what is going on when they are in the field. When fall hazards, impalement hazards or other situations arise, it is best the hazard is minimized immediately for the protection of themselves or others that may pass through. Management should be a double check in all situations. To be effective as a Project Engineer, you have to gain the trust of all the people working with you. Don’t go around and bark orders; rather, carry a hammer with you and if you see that handrail is loose or if a board is missing over a hole—fix the hazard yourself. The more you fix on your own, the more people will be willing to help you when you are busy. Safety does not come with a switch. It should always be [the top priority of] every task—from working next to traffic, or coordination picks with the crane, to putting Christmas lights up on the house. If your safety lacks on the site or off the clock, your habits will carry over to the other, and you will end up being useless at both if you were to become injured.